Recently I enjoyed a mini break in Devon. You might think that October isn’t the ideal month for a seaside trip, autumn in Britain can be either spectacularly warm and sunny or stormy and wet. I was lucky – I had three days of blue skies, bright sun, and fantastic sunsets. 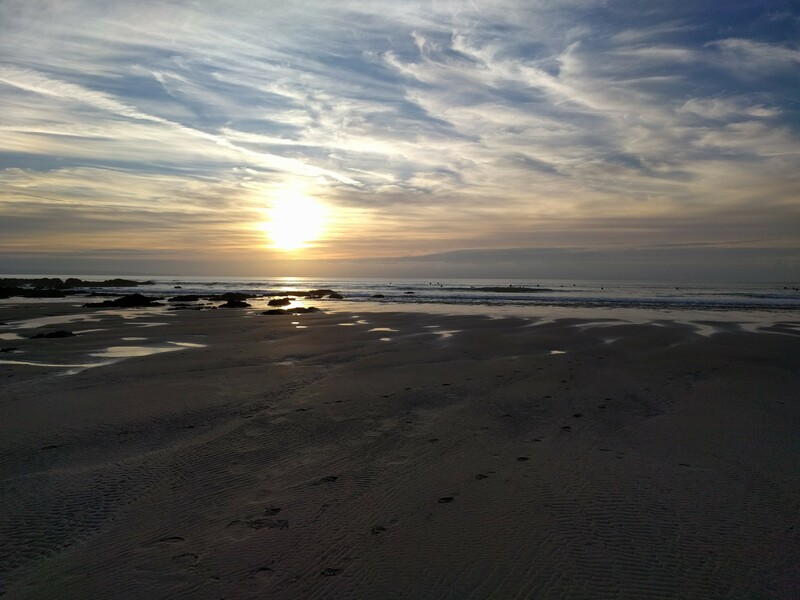 My husband and I were visiting somewhere we’d only discovered twelve months ago, a small village on Devon’s north coast, with a beach renowned for its surf. Our previous visits were made in winter when it is very quiet, but this time, at the tail end of summer, there were quite a few more surfers, from tiny tots to people my age. 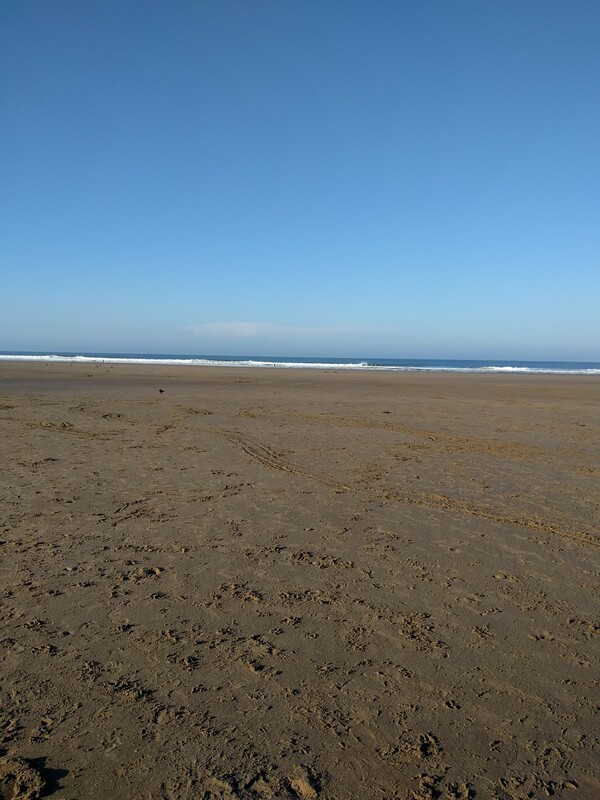 Now neither of us is a surfer, but we both enjoyed walking along the clean, sandy beach each morning and evening, watching and admiring those hardier souls who ventured out into the waves. It looked such fun that I’m planning on investing in a wetsuit for my next trip; even if I can’t manage a surfboard I’m sure I can deal with a body board. I’m determined to give it a go, it looks amazing. Of course, me being me, every trip I make becomes an opportunity for research, and this trip was no exception. 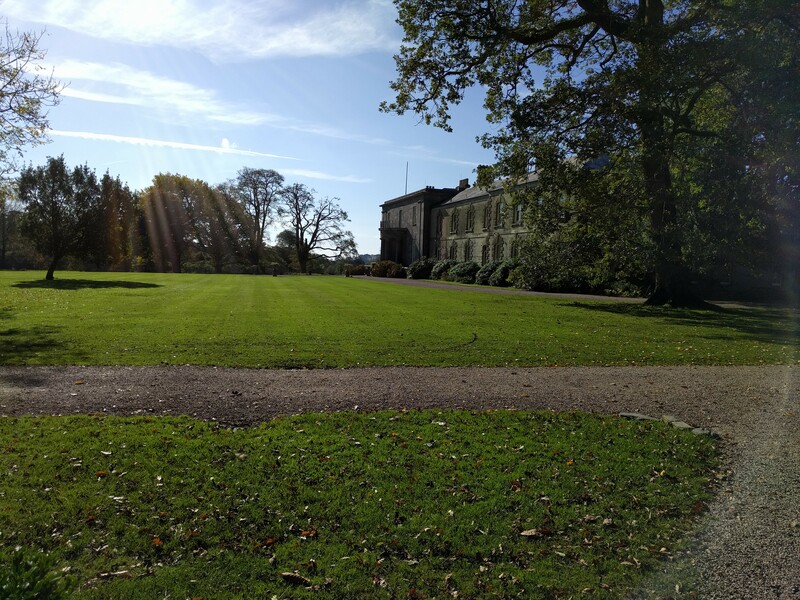 Our first full day in Devon was spent at Arlington Court, a fabulous National Trust property near Barnstaple. The current house, built in 1823, stands not far from the site of the previous Georgian mansion, which had only stood for thirty years before succumbing to structural problems. The Chichester family who owned Arlington had established themselves in the area back in the fourteenth century, building up their wealth, power, and influence by judicious marriages to other wealthy families. The property was left to the National Trust by Miss Rosalie Caroline Chichester the only child of the previous owner, Sir Alexander Palmer Bruce Chichester, 2nd Bt. Rosalie never married and by leaving it to the National Trust on her death in 1949, she ensured the security of the estate’s future. The house, though large by present day standards, somehow feels like a family home. 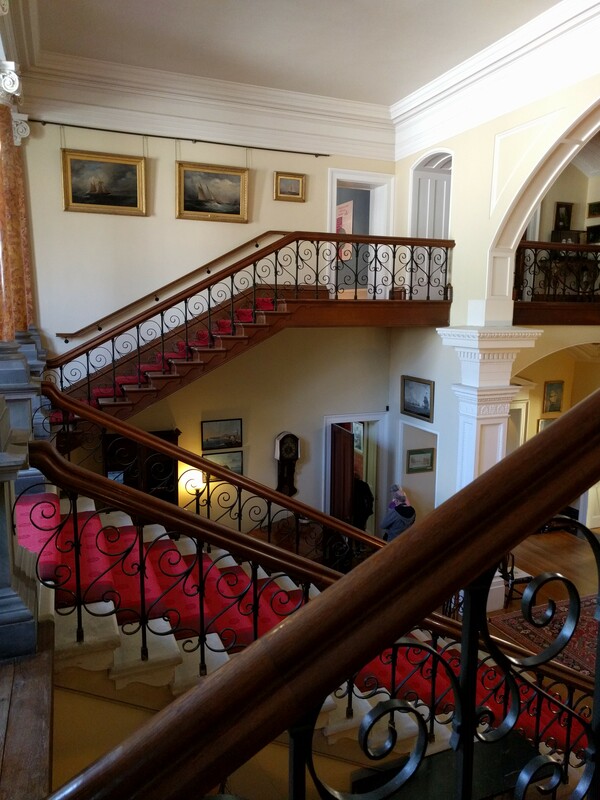 It is not overly grand or imposing, although the entrance hall with its white walls and dramatic staircase, which at the landing divides to form two galleries, is certainly impressive. 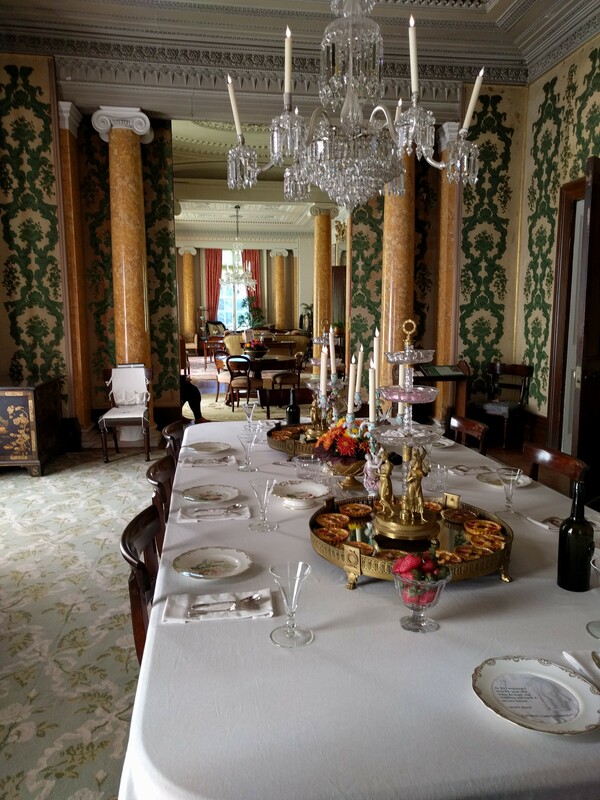 My favourite room was the aptly named Long Room; a large space that, by the clever use of hinged screens hidden behind Ionic columns, can be separated into three separate rooms: the Dining Room, the Ante Room, and the White Drawing Room. Have a close look at the columns in my photo; they look like marble, don’t they? I thought so too, until I read the information panels. They are in fact made of scagiola, a material made of plaster mixed with glue and dyes, which can then be painted and polished to resemble marble. Perhaps the hero of my next book will have pillars made of this in his London town house? 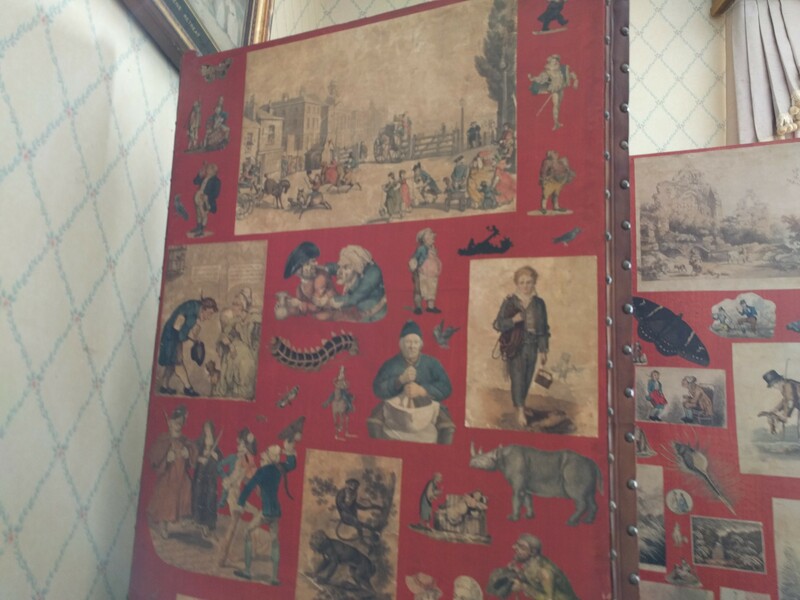 Another feature of the dining room is the original wallpaper dating from 1839. 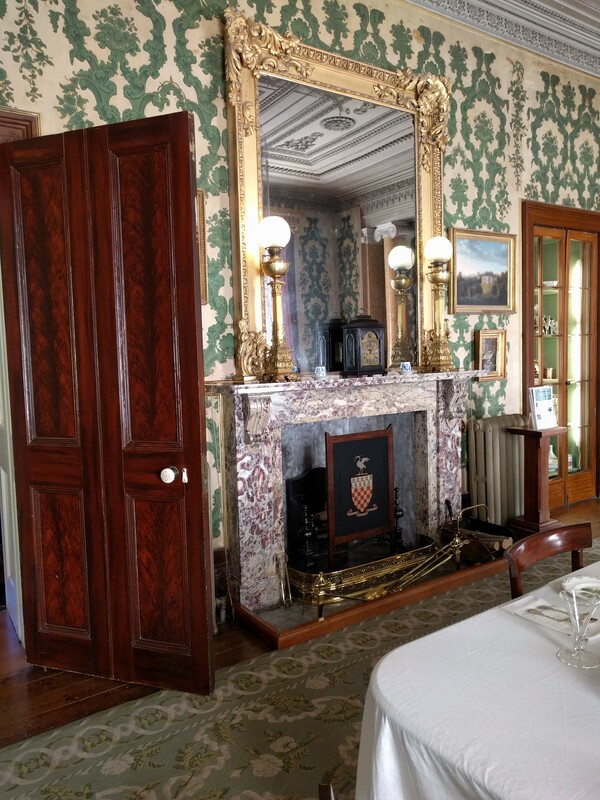 I was reliably informed by one of the knowledgeable and friendly room guides that its green colour was due to the use of arsenic. Eeek! The highlight of the Drawing room for me was the beautiful thirteenth century Flemish Psalter; a magnificent small manuscript with fantastic illuminations adorned with gold leaf. Having worked with similar objects for a large part of my life, it is lovely to see one so beautifully preserved and cared for outside of an academic archive. Another room among the many open to visitors in this lovely house is the one Rosalie Chichester used as a child; it is full of books, ornaments, knick-knacks, and photographs, reflecting the interests of this inquisitive and intelligent Victorian teenager. I can imagine her spending happy hours cutting out the drawings and pasting them onto the large screen that resides in this room (see photo). Well, I won’t bore you with details of every room of this wonderful house; you’ll have to pay your own visit. I’m sure you’ll find it worth the effort. Before we explored further though, we stopped for lunch in the little café housed in the original old kitchen. 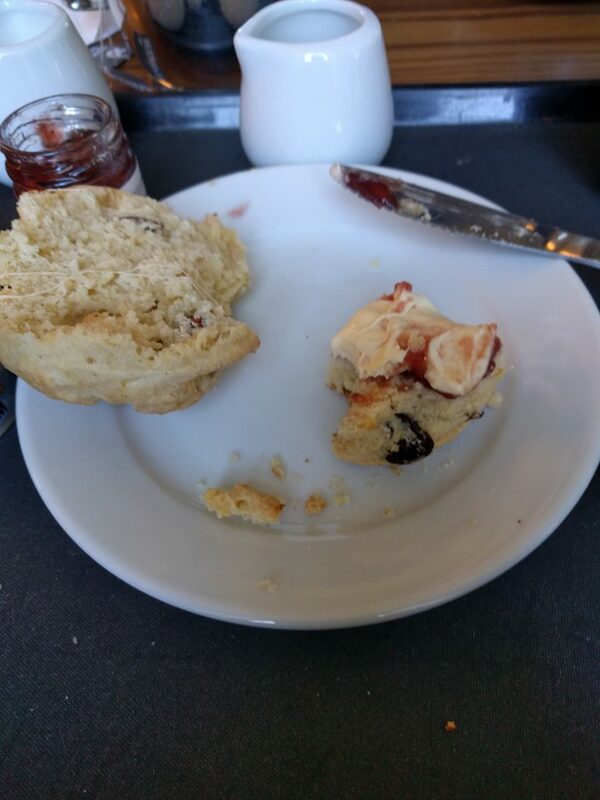 Feeling greedy (well I was on holiday), I decided to have a scone for dessert. As you can see, I’d devoured half before I remembered to take a photo. It was seriously good! Join me soon for more details of my trip to Devon.